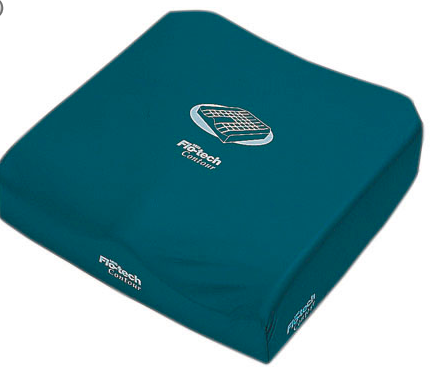 Invacare Matrx Flo-tech Contour Visco Cushion. Conforms to the shape of the body - The Invacare Flo-tech Contour Visco cushion is moulded from visco-elastic (memory) foam, which is temperature-sensitive to the body. As the foam warms, the contoured surface area conforms to body shape, improving posture, increasing comfort and maximising the surface area in contact with the client, thereby optimising pressure reduction. The Flo-Tech Contour Visco is suitable for those considered at ‘High Risk’* of developing pressure ulcers. Three dimensional anatomically shaped visco elastic foam for good pressure redistribution and ride comfort. Can also be helpful in reducing the tendency to forwards slide. Polyurethene base layer to protect against bottoming out. Cushion height makes it suitable for heavier or bony individuals, or those who wish to increase their sitting height.